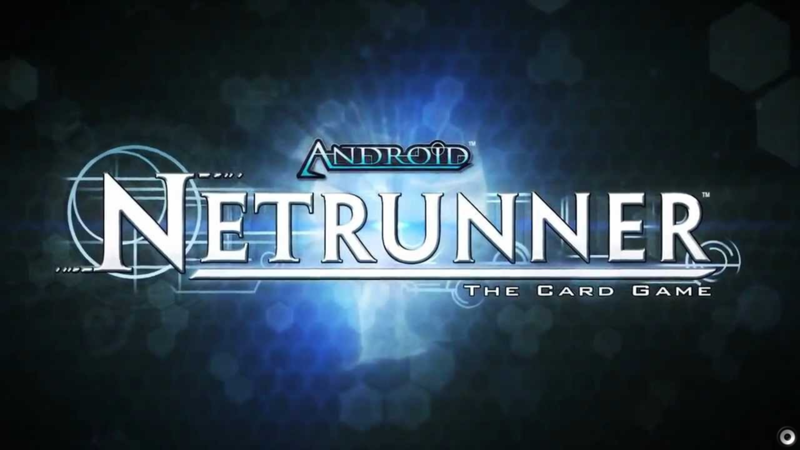 Hey guys – before I start – it’s worth to mention that I live in Cyprus, where Android: Netrunner’s community is extremely small and undeveloped. Isengard and me will take matters in our own hands and try to make the community grow. 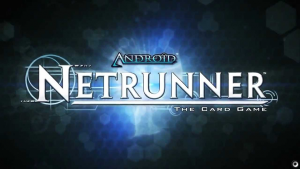 The Cyprus Comic Con will take place on August 29th, 2015 and I’ve been given a table to show Android:Netrunner to newcomers. You realize that, people will be coming and going and there will be no luxury of spending half an hour explaining all the rules of the game, more so playing a round in full. That would consume about 1,5 hour. 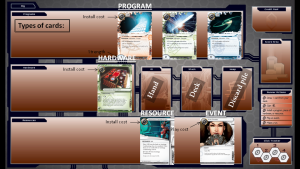 First off, I did my research and read FFG’s demo guide, which makes a lot of sense. Inside the kit, there are smaller (illegal) decks that go to 6 instead of 7 agenda points. Corp = 39 cards, Runner=30 cards. 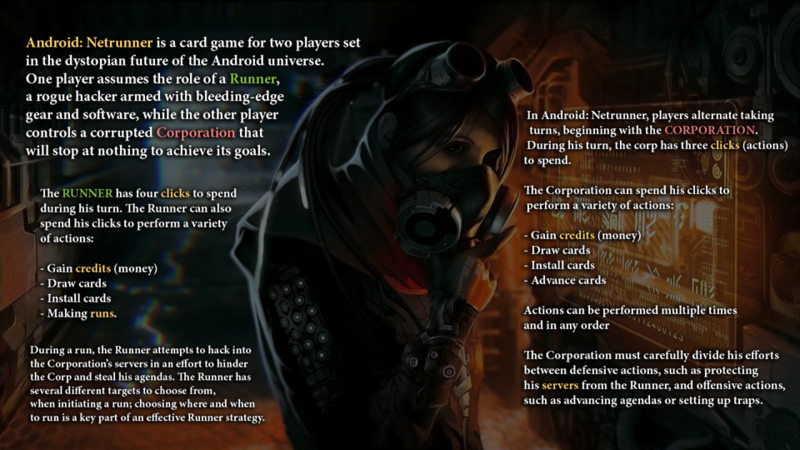 What I didn’t like is their deckbuilding choices for both the runner (Kate) and the corp (Jinteki) decks. 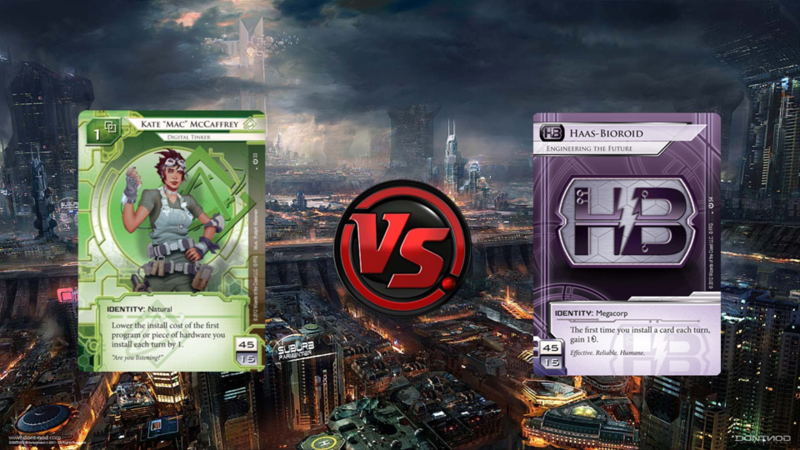 Don’t get me wrong, but I always felt that FFG’s suggestion to go Kate vs Jinteki is not the best. Jinteki is quite poor to be able to utilize it’s traps and beginners won’t be able to bluff remotes effectively. As a result, I made my own mini-decks, which I will go in-depth later in this article. First things first…start by “selling” the game. It’s very thematic about how a hacker wants to digitally infiltrate a corrupted mega-corporation, to steal their data before they develop them. 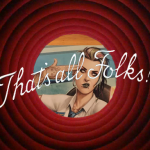 This will take a couple of minutes, explaining in short clicks, credits, servers and runs. Next slide, explain in short the different factions of the game and that for this one it’s going to be Shaper vs HB. I chose those factions because Shaper is very direct, with no weird tricks like Inside Job, Bank Job, Account Siphon, tag removals, viruses, milling, fixed breakers etc. Just solid economy, nice breakers and running. As for HB, there’s solid economy for scoring windows and plenty of taxing ICE with ‘End the Run’ subroutines. Next up: Actions! You’ll notice that I shopped the cards, removing a few of the actions on both sides. There are no tags or viruses in those decks. 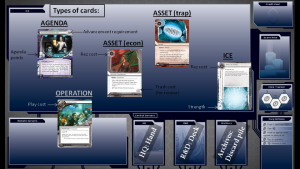 It’s all about drawing cards, gaining money, installing, advancing, running and rezzing ICE. Explain the ID abilities and a bit of their strategy. HB needs to protect his centrals first, then set up a scoring server. Kate needs to put pressure on the central servers early on, then find the necessary tools to hack the security systems. The board! 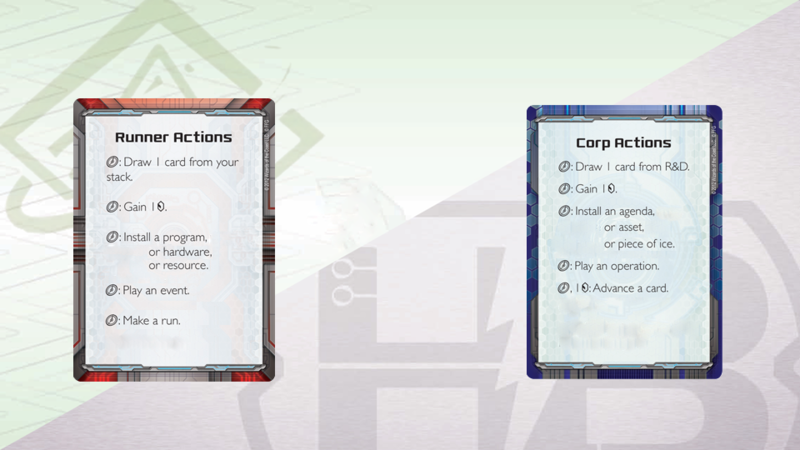 Start with the corporation board, because of the most important card of the game: the agenda. Explain the 4 types of cards (agendas, assets, ICE and operations), agenda points, advancement requirements, rez costs and play costs. No need to explain the trash costs yet, leave it for the actual game. Be sure to comment on the 3 types of ICE, then explain the central servers and how to create remotes. Runner board is much simpler, so first explain the 4 types of cards (programs, hardware, resources and events). Go into detail about icebreakers, strength and types of ICE again for both players to understand this. You do not need to go into detail about every single card for either player, they can read it during gameplay. Just explain ICE encounters and breaking subroutines. 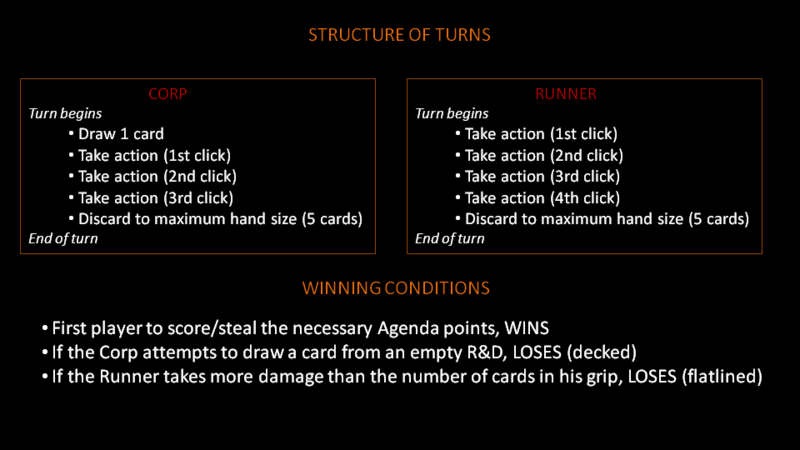 Lastly, structure of turns which is pretty simple. 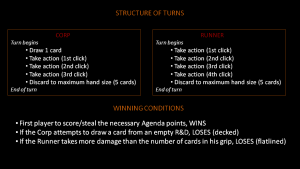 Corp goes: draw, 3 actions, discard to hand-size. Runner: 4 actions, discard to hand-size. Winning conditions, better explain that Snare again and advice the runner to be cautious. Upgrades. Just a single card per remote server! 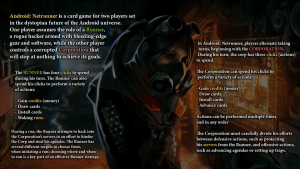 Difficult synergizing cards like Biotic Labor or advancable ICE/traps. Only cards to advance are agendas. 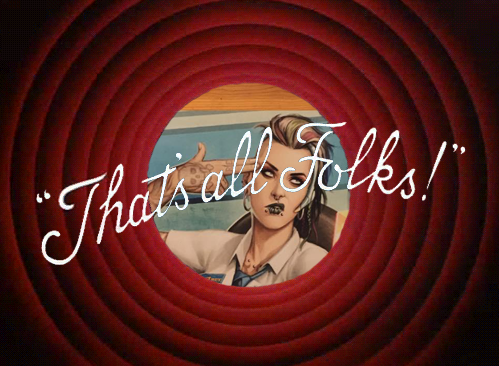 New Jinteki players won’t play the shell game. They won’t take risks bluffing an agenda as trap and they end up losing. I’m a big fan of the Jinteki church, but it’s a terrible choice for a complete beginner. As I said before, I want to avoid combo cards like Trick of Light and Chum, in case the player sees it early and doesn’t know what to do with it. Priority Requisition and Nisei MK II are liabilities. HB has better agendas, in case they get locked. Playtesting showed that Kate easily locks the remote. New players use Neural EMP just as soon as they draw it, they don’t know how to set up a kill. Better go for a big remote and scoring. Jinteki PE & Restructure? Who are we kidding? Melange Mining Corp. is a difficult card to understand right away and slows the tempo of the corp. The extra credit that HB provides, makes a huge difference. 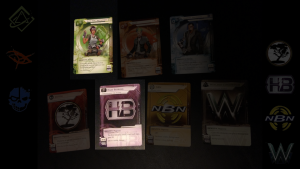 HB is richer, cards are simpler…just make sure to skip the NAPD Contract bad publicity text and the Snare tag. They may ask about Guard wording, that’s nothing. Freelance Coding Contract – They might sell important breakers and be locked out. Also, the most they can get out of this card is 8cr, late-game and IF they won’t trash the spare programs. Public Sympathy. What? How is that going to be of any use? Kate wants to run, not hold as many cards as possible. Aesop’s Pawnshop. Again, avoid ‘when your turn begins’ cards. There are no good cards to sell anyways. Probably just the completely useless aforementioned Public Sympathy. Ice Analyzer is questionable, just like Professional Contacts. The first is difficult for a beginner to keep track of, the latter is a tempo-loss, since Kate has solid economy already with Magnum Opus. They’re both 1ofs, so I excluded them. Modded is a great card, but Kate is too rich already in a very small 30-sized deck. Net Shield is out, because…HB, no Jinteki. After playtesting the decks, I noticed that Kate is quite rich and can dominate the game if HB won’t rush and trust me, they will NOT rush. Ninja over Pipeline and Corroder over Battering Ram to make those runs more taxing late-game, after Wall of Thorns is rezzed. One might ask, why WoT over Heimdall 1.0…well, I avoid brain & meat damage and also it can be broken with clicks. I already fear Eli 1.0 will be confusing, so better explain -during gameplay – that it goes over centrals. Playtesting with Kate vs. Jinteki, I noticed most beginners waste Infiltration on ICE instead of cards inside remotes, thus same thing will happen against HB. Therefore, even though Infiltration might not appeal against HB, (Snare aside – there are no other traps), along with Forged Activation Orders it proves useful to gather intel on the Corporation’s defenses. Almost all the cards are 2ofs because of the small deck size and for they might lose some critical pieces to Snare!